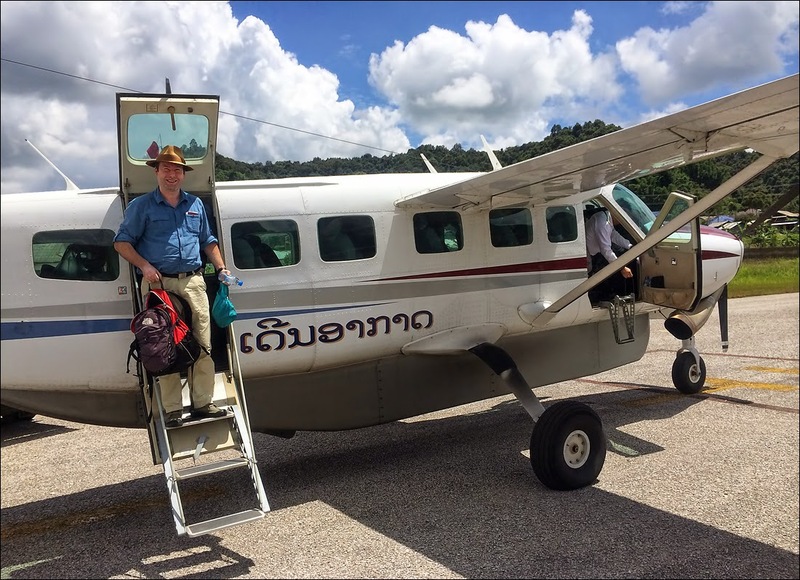 This post is the first in a series concerning my travels in Sulawesi, one of the larger islands in Indonesia, in the summer of 2015. 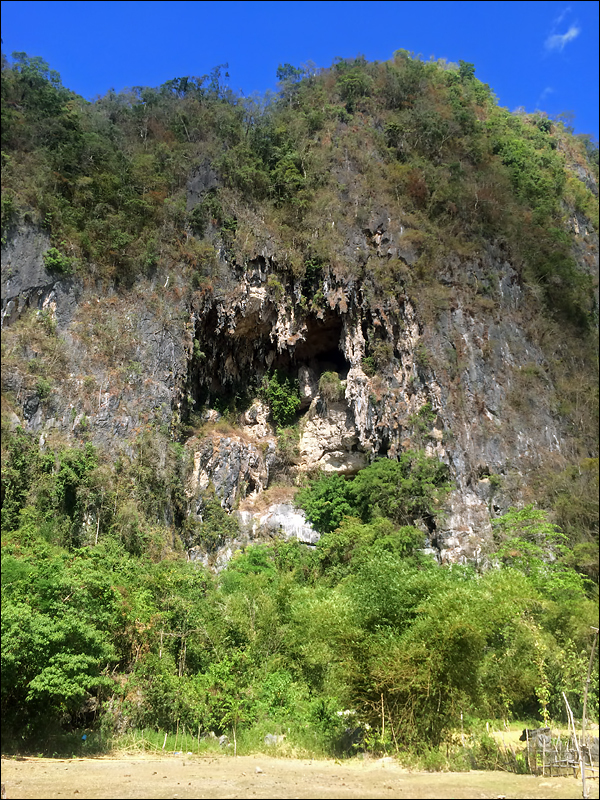 In this first post I will discuss some of the caves with early Upper Palaeolithic cave art which we were able to visit in the Maros region of South Sulawesi. 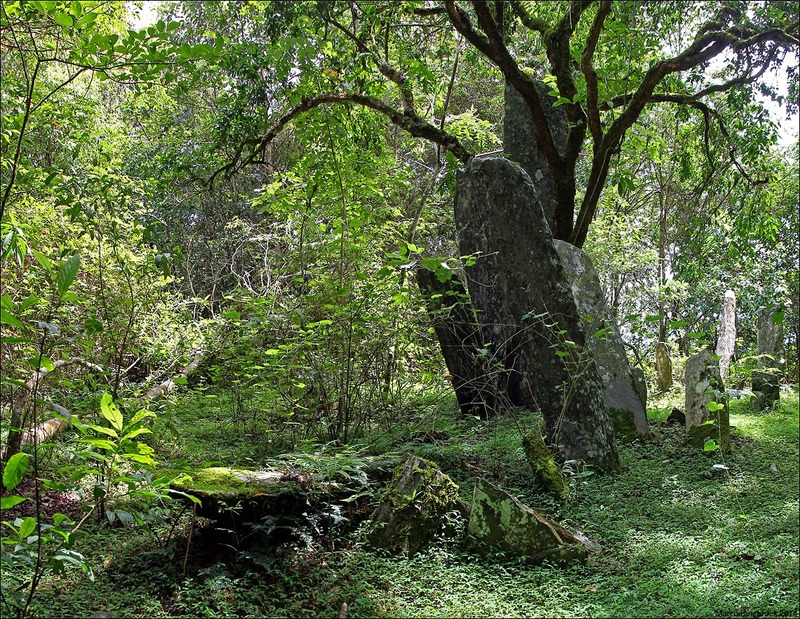 2014 saw spectacular new results for portable and rock art emerging from Indonesia. There was the discovery, in an old collection (the famous Dubois collection from the 1890-ies), of what looks like a very old engraving on a shell from Middle Pleistocene deposits at Trinil, Java. 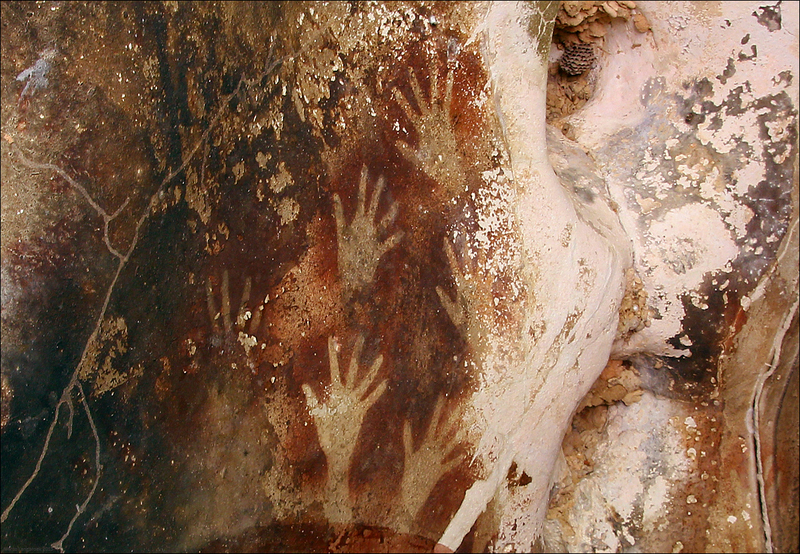 And very old dates were published for rock art on cave walls in the Maros region, Sulawesi. It is this latter region which I visited this summer. The Maros region in southwest Sulawesi is an eroded limestone karst area with caves, situated not far from Makassar. 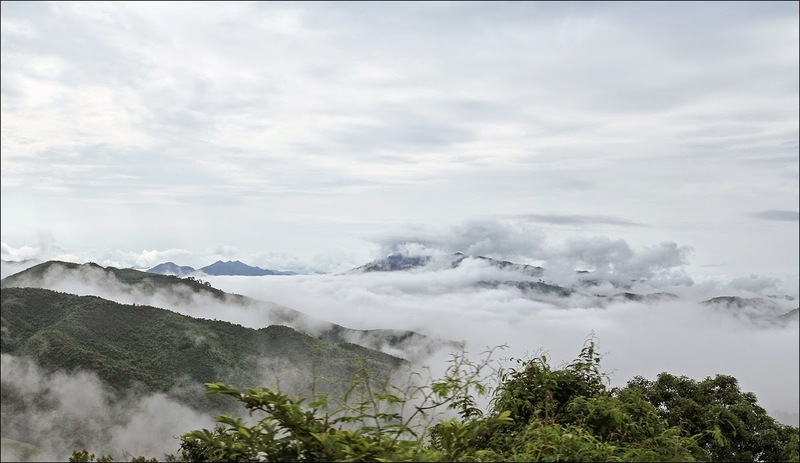 Over 60 caves with cave art have been discovered in this region, mostly at the foot of these mountains where the mountain range meets the coastal plain. 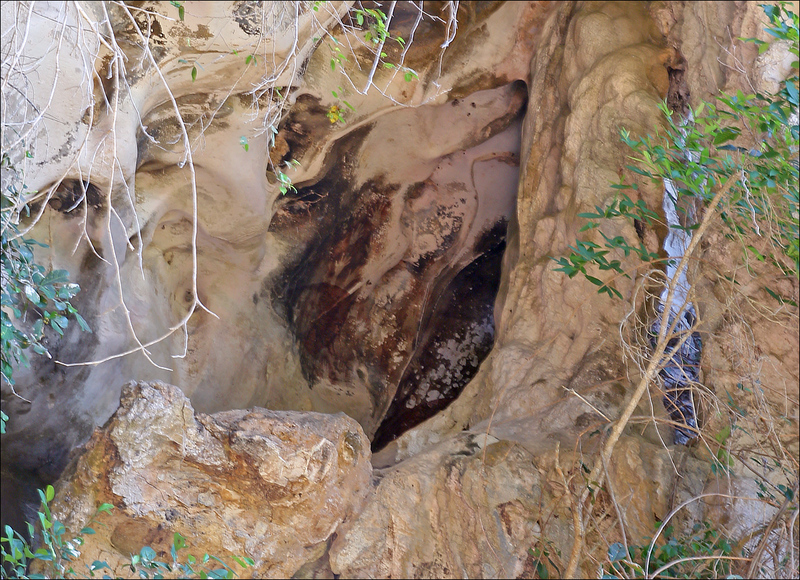 These rock-art caves are generally situated at elevations of 30 to 100 m above sea level, and not seldom up to several tens of meters above the alluvial plain. 2) more abstract anthropomorph and zoomorph depictions in black sketchy outlines. Where these two styles are superimposed, the second style always overlays the first one, indicating that the first style is the oldest. The second, younger style is usually considered to be coupled to the Austronesian migration during the Neolithic, around 3000-2000 BC. In 2014, Aubert et al. surprised the archaeological world with spectacular dates which they obtained on speleothems, calcium carbonate deposits, covering the older rock art of the first style at a number of caves in the Maros region. They used a technique called Uranium-series dating. This technique measures the decay of 234U to 230Th. The thin calcium carbonate speleothem which they dated is the result of calcium carbonate precipitation from water flowing over the cave walls some time after the paintings were made. This water contains dissolved 234U that is next incorporated in the speleothem. By dating the speleothem with the Uranium-series method, you get a minimum age for the paintings covered by this speleothem. 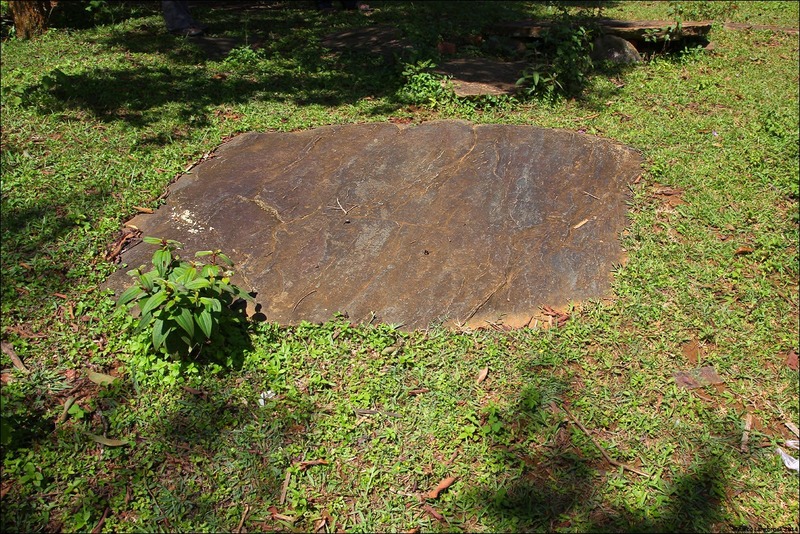 At Leang Timpuseng in Maros, a speleothem covering part of a hand stencil was dated to a minimum age of 39 900 BP. A speleothem covering part of a painting probably depicting a babirusa in the same cave yielded a minimum age of 35 300 BP. 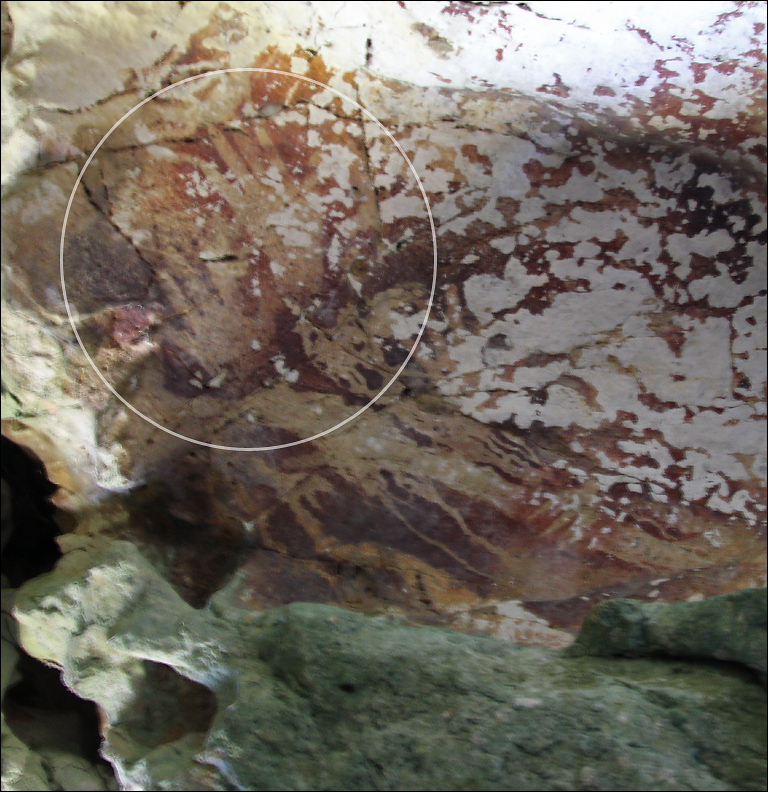 Similar ages were obtained in a number of other nearby caves, placing the paintings firmly in the early Upper Palaeolitic. These are spectacular dates, as they are are among the oldest dates in the World for parietal art (parietal art = rock art). 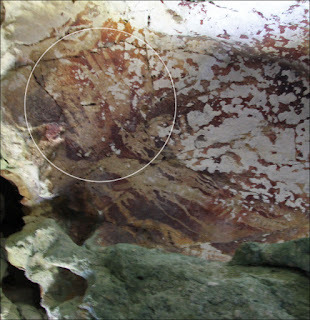 The oldest dates for a cave painting so far have come from El Castillo in Spain, where a circular dot of red ochre has been dated to a minimum age of 40 800 BP. A hand stencil from the same cave has a minimum age of 37 300 BP and was the oldest hand stencil until Leang Timpuseng yielded an older date. The oldest animal depiction, a painted rhinoceros from Chauvet cave in France, has been dated around 35 000 BP - a date similar to the babirusa painting in Timpuseng. 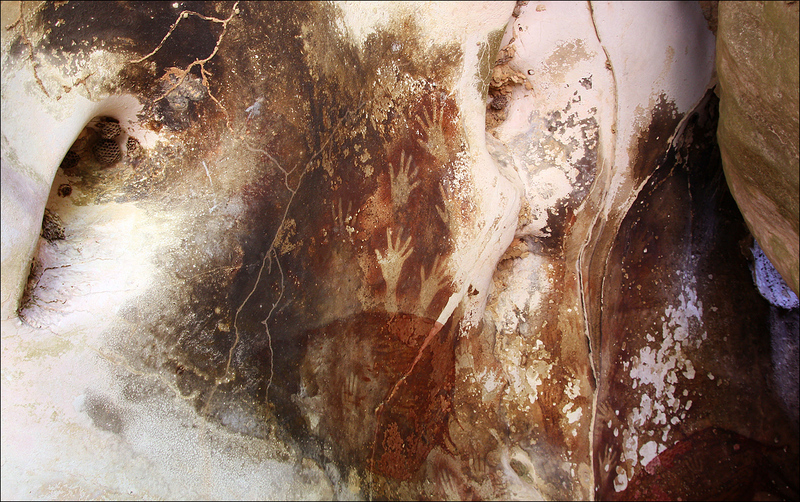 The Chauvet dates are however not uncontested as other research suggests that the art at Chauvet is younger, perhaps even post-dating 26 000 BP (see below). 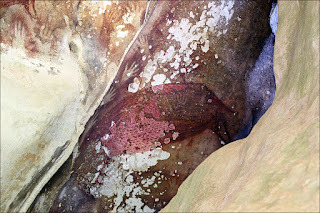 The babirusa painting at Leang Timpuseng in Sulawesi is at least as old, if not older, as the rhinoceros painting from Chauvet. The hand stencil from Leang Timpuseng is older than the hand stencil from El Castillo, and in fact currently the oldest dated hand stencil in the World. 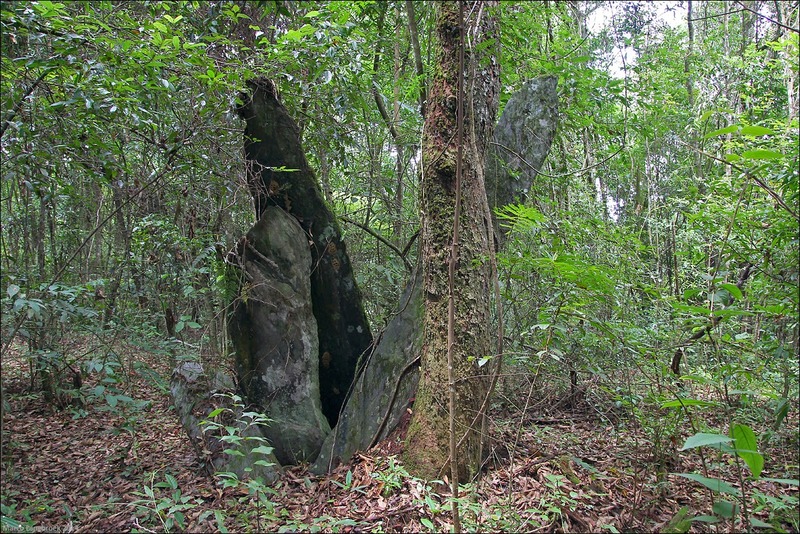 It should be noted here that Timpuseng and Chauvet were dated by different techniques: Uranium-series on covering speleothems at Timpuseng versus 14C (radiocarbon dating) from charcoal used for the paintings at Chauvet. The latter technique is problematic when applied to cave paintings, for various reasons. One is that the paintings could have been made with 'old' charcoal picked up from the cave floor. Another problem is that it concerns ages close to the limit of applicability of the 14C method, and by necessity small, easily contaminated samples (that can be contaminated by organisms living on the cave wall, for example). While Uranium-series datings also have their problems, the method is generally seen as more reliable than 14C when applied to cave art. 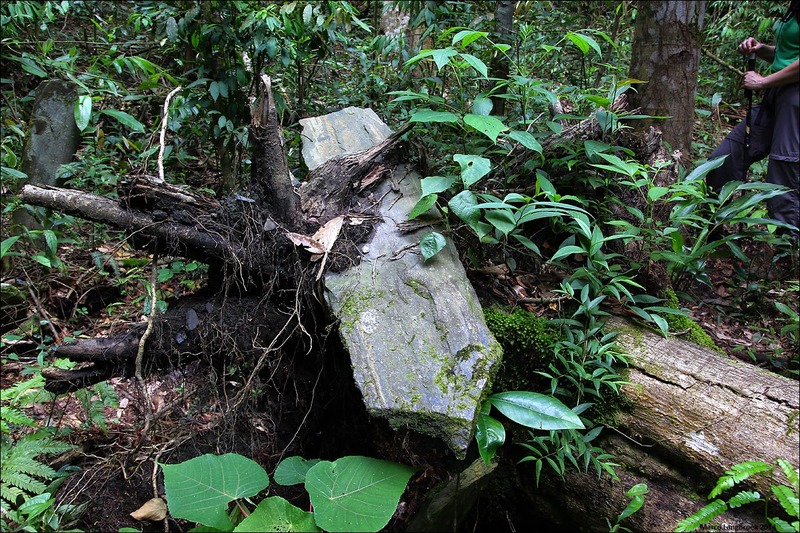 Leang Timpuseng itself is not open to the public and can only be visited with a special research permit. Two other nearby caves with similar paintings of hand stencils and babirusa are however accessible to the general public, and the cave art is well visible there. 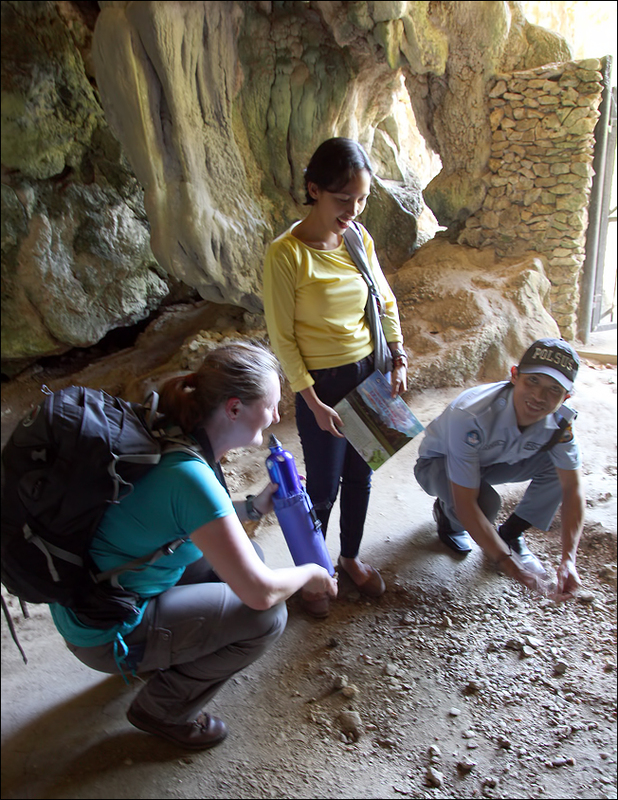 At Leang-Leang Prehistoric Park, 2.5 km north of Leang Timpuseng, the caves Leang Petta Kere and Leang Pettae can be visited, accompanied by a guide. 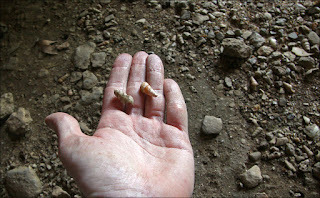 I will discuss both caves below and provide pictures and descriptions of the art in these caves. 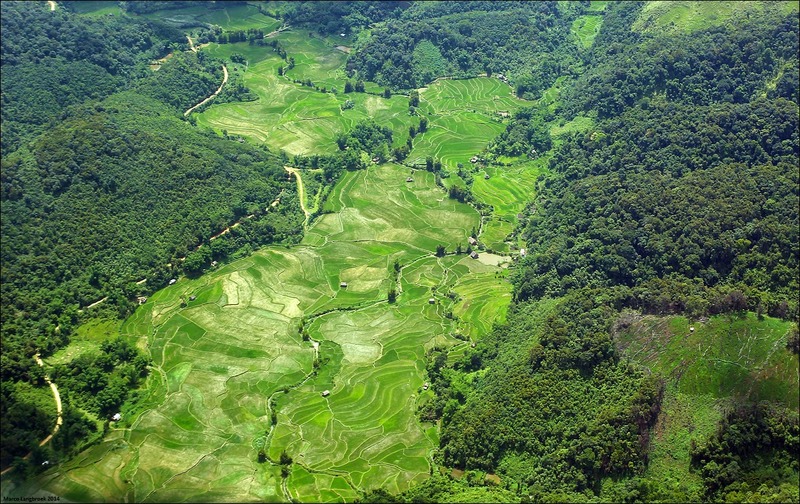 Leang-Leang Prehistoric Park was created in 1999. The park can be reached through a small side road leaving the main road Maros-Soppeng at about 5o.01392 S, 119o.6521 E (more details on how to get there from Makassar at the end of this post). 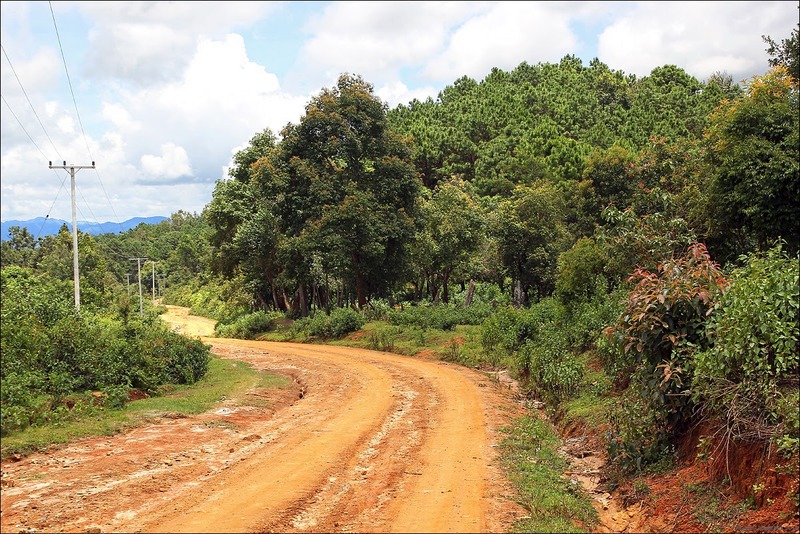 Follow this road for about 5.3 km. The entrance to the park is located at 4o.9782 S, 119o.67405 E. Behind the gate is a spacious parking lot and nicely sculpted lawns. Some amazing erosion features are visible behind the parking lot. 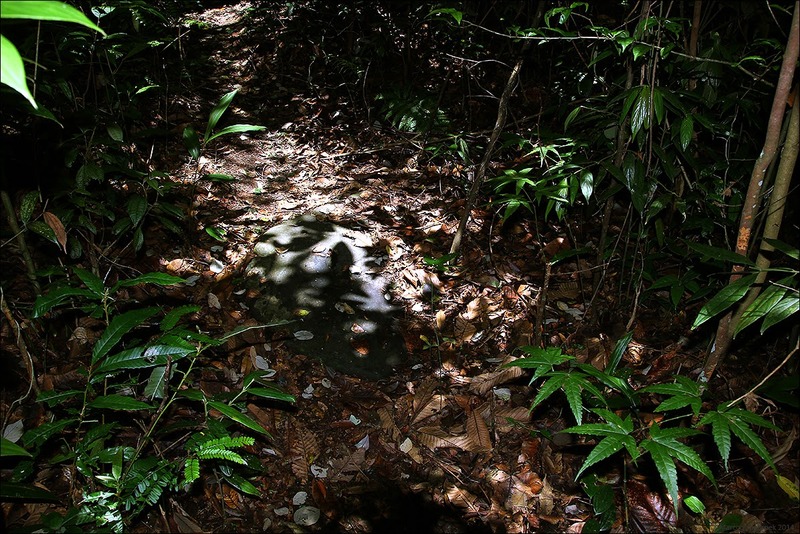 Concrete paths lead to the caves. You buy a ticket (10 000 Rp per person) at the gatehouse, and of course (as the Indonesians love their bureaucracy) you fill in your name, residence, occupation, reason of visit, port of entrance and passport number in the ledger. Don't forget to ask for the information leaflet. 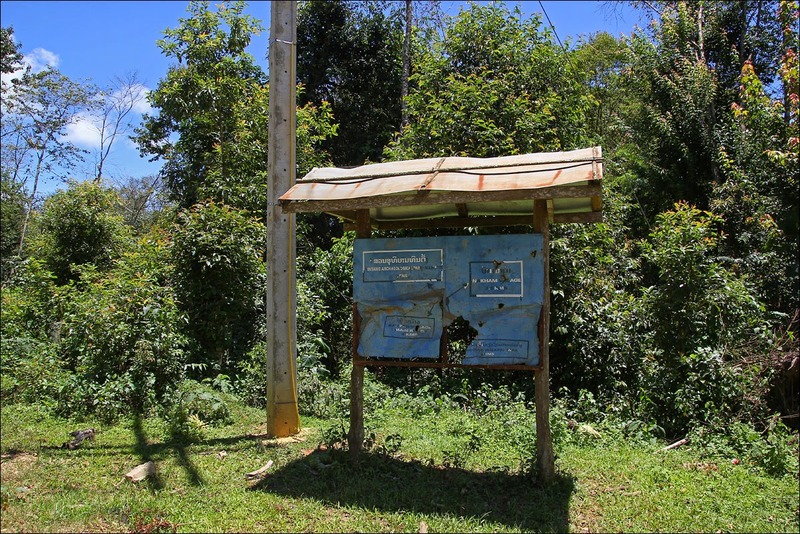 It is in Bahasa Indonesia and features a map of the area and pictures, as well as basic information. 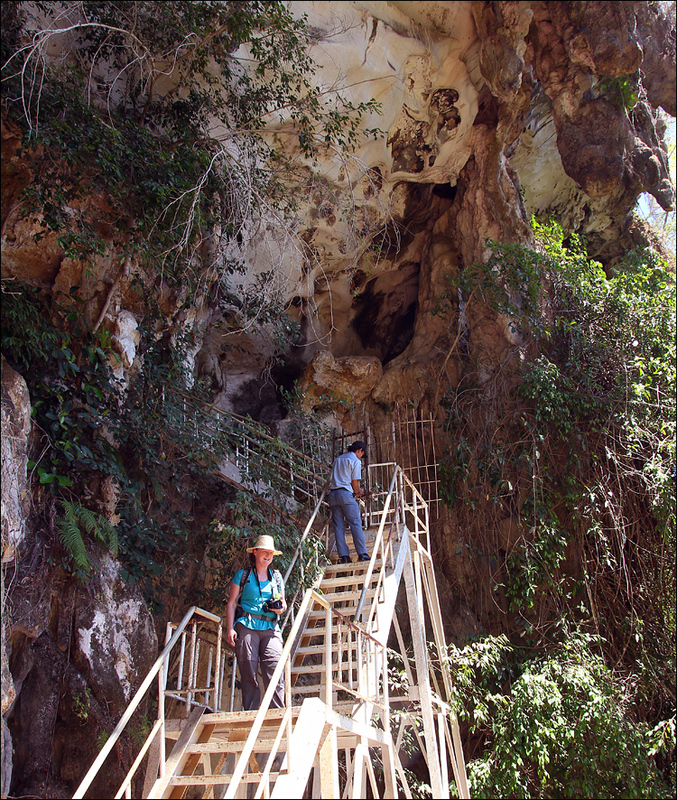 A park staff member will accompany you to the caves. The park staff that was present during our visit in late July 2015 spoke very little English, but they were very friendly and helpful. 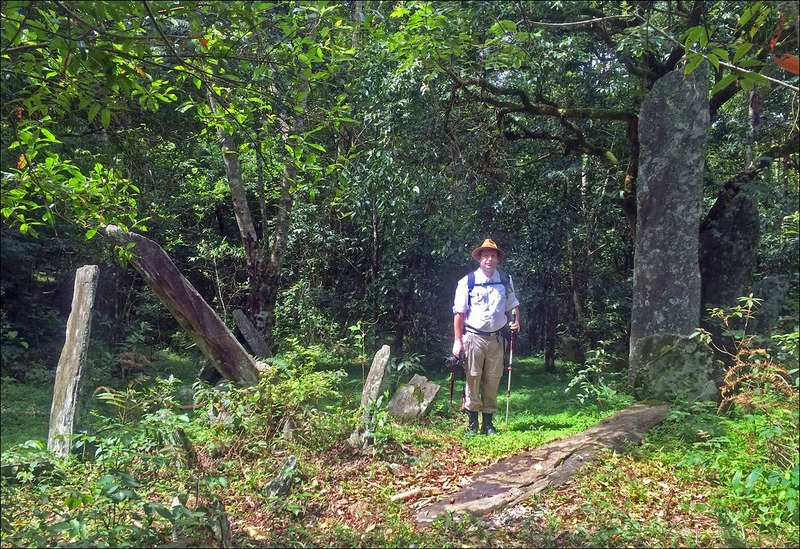 Between his few words of English and my few words of Bahasa, and with some translational help by Wanti (the Indonesian woman accompanying us on the trip), the park guide and I managed to have a basic conversation about the archaeology there. If the staff notices that you have a genuine archaeological interest, they will do their best to point out and explain things. Photography is allowed, but do not use a flash as this is detrimental to the paintings. 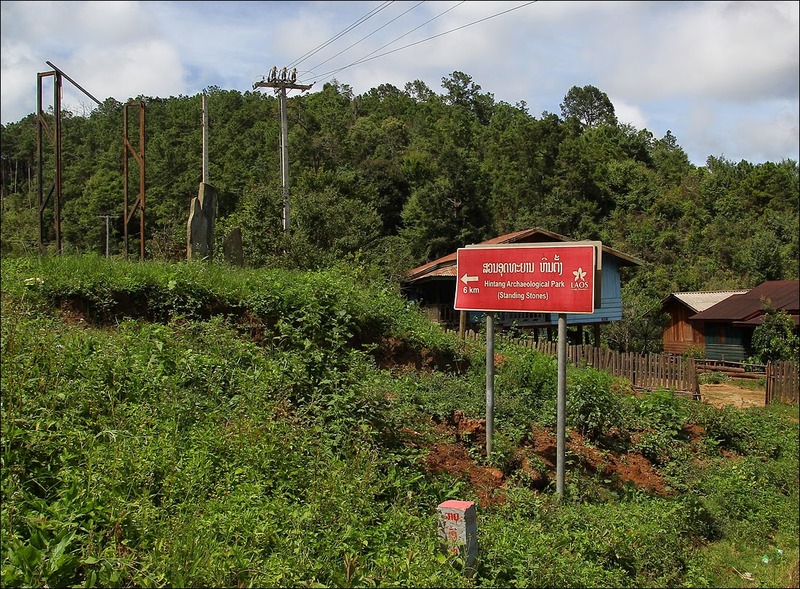 Take a torch with you to Leang Pettae (for Leang Petta Kere it is not needed). 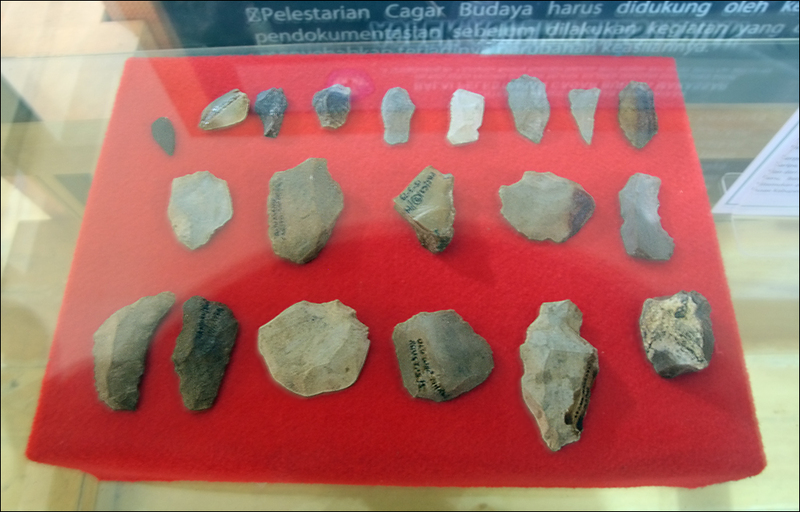 If you want to see some of the artefacts found in the Maros caves, ask the guide to open the small museum and information center for you when coming back from the caves. 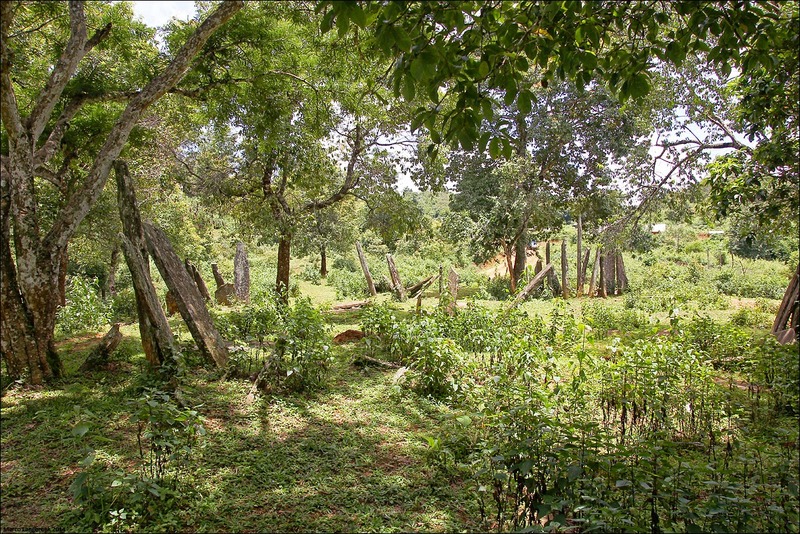 Here, you will find a few stone tools, some potsherds, shells and some animal bones on display, and a few information panels. The information panels are in Bahasa Indonesia only. The stone tools and pottery shown in the visitor center are much younger than the cave paintings. They are a few thousand years old, dating to the mid Holocene and were made by the first farmers in the region who used these caves too, at a much later date than the Pleistocene hunter-gatherers who made the cave paintings of the first style. 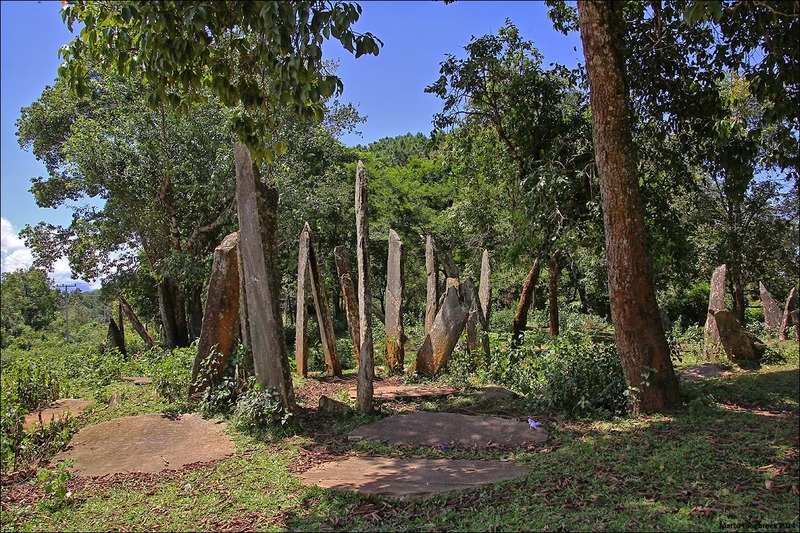 Stone artefacts found in these caves include the iconic 'Maros points': bifacially worked, hollow-based triangular points, sometimes serrated, that might have functioned as arrowheads. 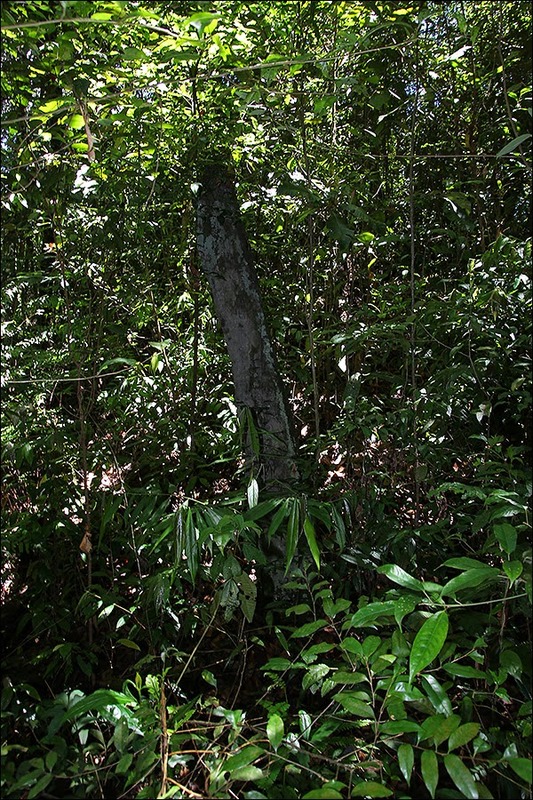 They are distinctive for the late Taolean of south Sulawesi. While the Holocene finds in these caves are certainly interesting, the most famous aspect of the caves, certainly after their recent spectacular re-dating, are the cave paintings. These are much older. Below I will discuss what can be seen in the two caves at Leang-Leang. Of the two caves, Leang Petta Kere has the best preserved paintings. The cave is a narrow fissure situated at 85 meter above sea level, and some 35 meter above ground level. A metal stairways leads to the entrance. At the top of the stairways, a narrow rock ledge leads to a small side chamber, just big enough to accommodate a few people. The narrow fissure with the rock art is just up from the extension of the ledge. For a good view of the paintings, you have to climb a 1.5 meter high rock in front of the fissure. In the cave, over 25 hand stencils and two paintings of babirusa (pig-deer, an endemic Sulawesi suid species) cover several square meters of rock wall. The babirusa paintings each measure slightly over one meter by half a meter. They overlap with and cover some of the hand stencils. 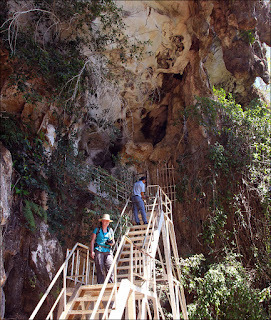 The second cave, Leang Pettae, is a narrow dark fissure situated at 50 meters above sea level. Van Heekeren excavated here in 1950. The cave art in this cave looks much more weathered than in Petta Kere: in places the cave wall is literally peeling off. 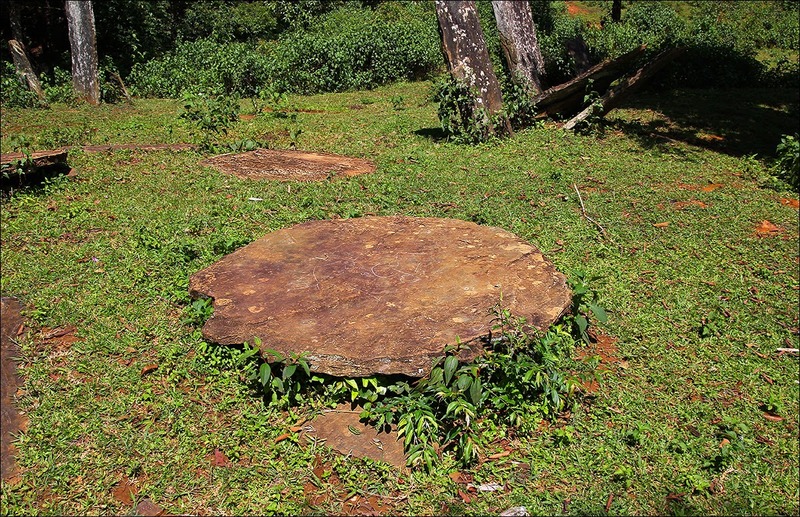 The cave floor near the cave mouth is covered by a "kjökkemödding", a Danish term archaeologists use for a kitchen-midden ('sampah dapur' in Bahasa), refuse heaps consisting of large amounts of discarded shell. 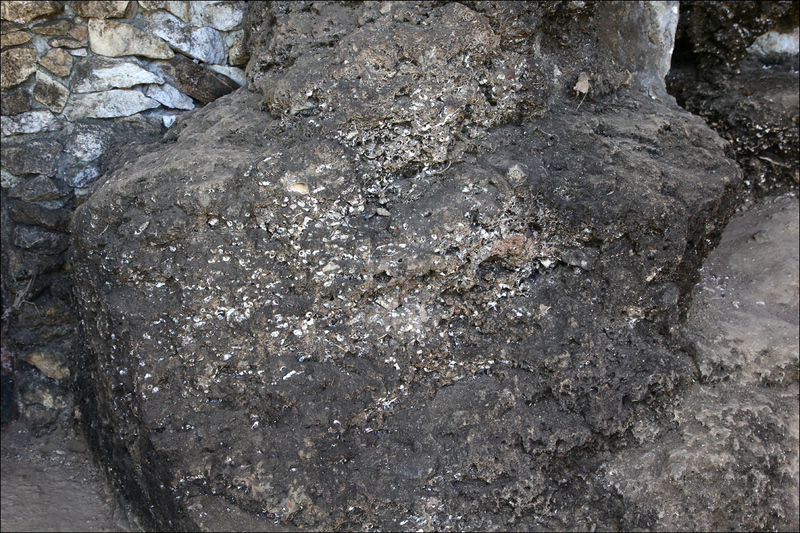 Some remnants of the original stratigraphy of these deposits can be seen in the form of a small profile of left-over sediment in a small corner of the cave. 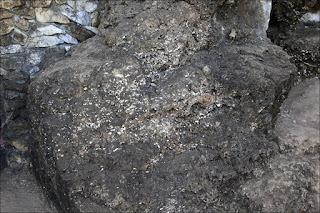 Where the cave floor is eroding, more shells area readily visible. These shells, from species still living in the stream which flows some 100 meter in front of the cave, are left-overs from prehistoric shellfish consumption. They date to the Neolithic, about 3000-5000 years ago, and are much younger than the cave paintings in the cave. The same is true for the stone tools excavated here. 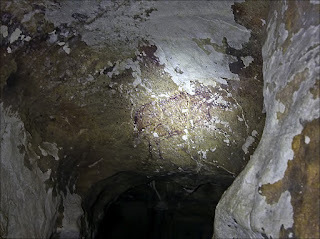 The cave art in Leang Pettae is more difficult to see than in Leang Petta Kere (also because the cave is much darker). Where the cave mouth narrows there are a few hardly visible hand stencils. On the ceiling of the narrow passage leading into the rock is a painting of an animal which Van Heekeren has interpreted as a boar. Below is a comparison of a photograph which Van Heekeren made when he discovered the boar painting in 1950, and one of my photographs taken in 2015, 65 years later. There is evident deterioration of the painting visible, notably in the head and front feet area. I strongly suspect this damage is from touching by visitors, as it closely follows the most prominent outlines of the painting. This shows how vulnerable the cave art is, and why you should never touch it. 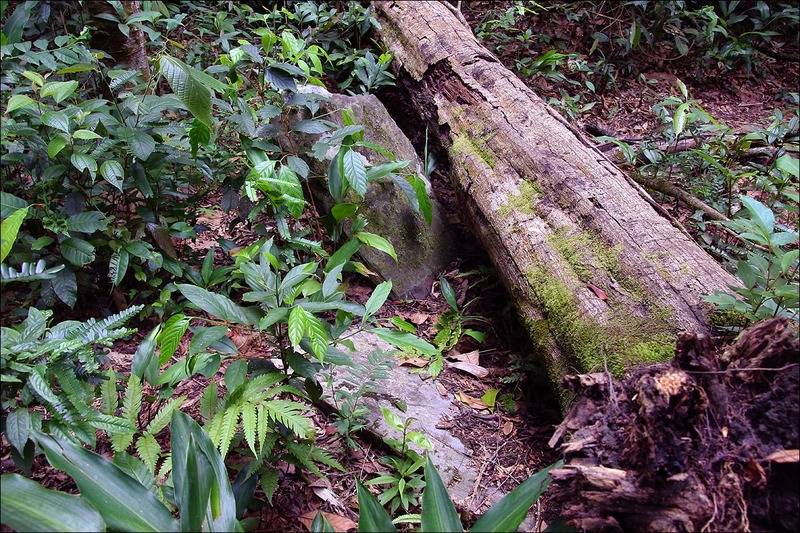 Painting of a boar at Leang Pettae, photographed upon discovery by Van Heekeren in 1950 (left), and in 2015 by the author (right). Deterioration is evident. Van Heekeren mentions what he believed could be an arrow drawn in "the cardiac region" of this painting, which I however can not really discern. The hand stencils on the ceiling are much more difficult to see, and are badly damaged by deterioration of the cave wall. 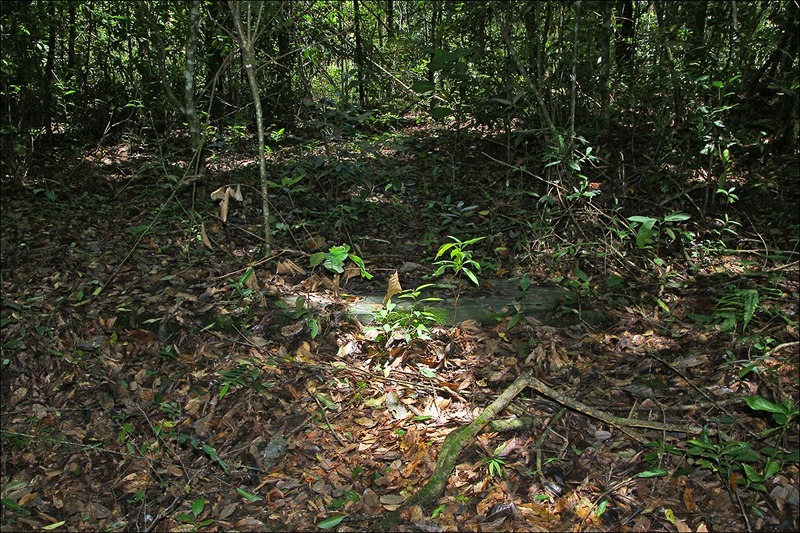 They are indicated by a circle in the photograph below (apologies for the slightly blurred picture: it is dark in Leang Pettae and I could not use a flash). As an archeologist, I often get asked the question: "what does it mean?". Why did prehistoric people paint on these cave walls? Basically, your guess is as good as mine. Theories abound about the meaning of Pleistocene cave art, ranging from ideas that it are adolescent graffiti scriblings (Dale Guthrie's hypothesis), art-for-art's-sake, to ideas about hunting magic (the most popular explanation, certainly when animals are depicted), to ideas that it is coded information for the purpose of initiation rites, messages to other groups, to theories (inspired by historic '!Kung San rock art from southern Africa) that it documents hallucinogenic-mushroom induced shamanic trance visions. Important to realize in assessing all these different hypothesis, is that there almost certainly is not one single explanation covering all rock art. The meaning and reasons will have highly varied with time and place and culture, or even person. 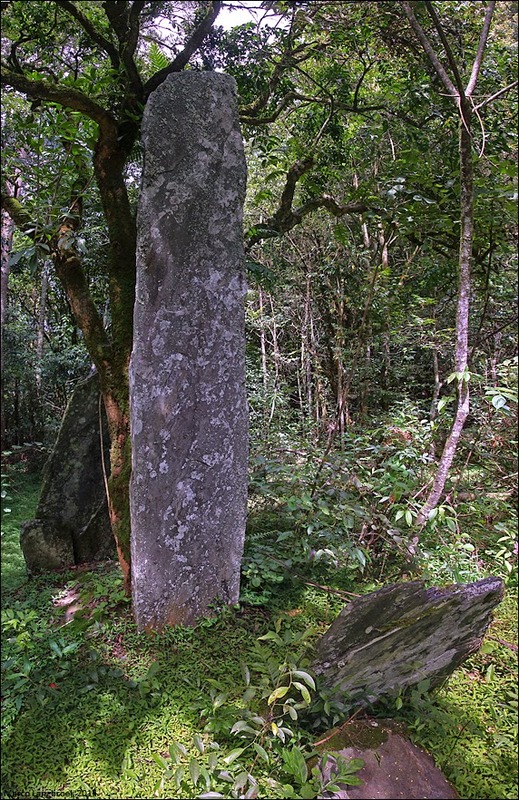 While ethnographic analogues can be informative, it is dangerous to transfer ethnographic examples one-on-one to prehistoric rock art. Some of the hand stencils at Maros (as is the case for some prehistoric hand stencils in Europe and Australia) are missing fingers. With regard to Maros, I have seen this explained, with rather definite undertones, as "ritual mutilations" to mourn the deceased. 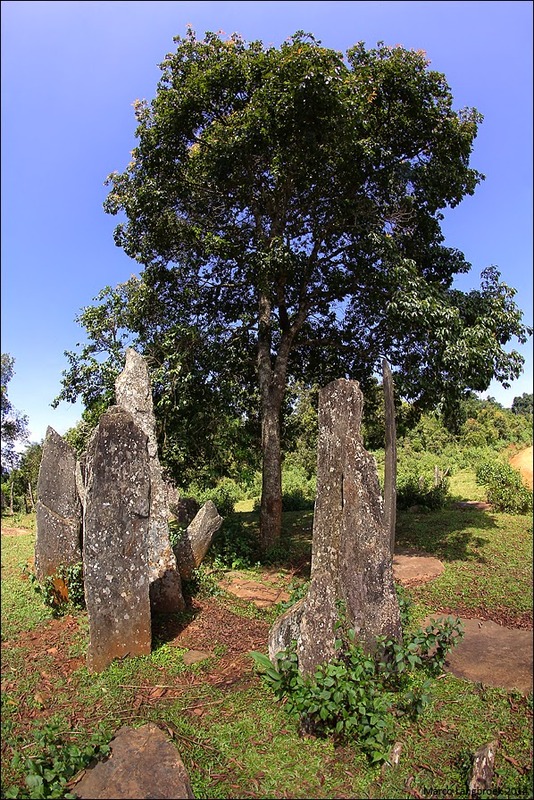 This is an explanation that is inspired by an ethnographic example of the Dani in the highlands of New Guinea: until recently the Dani cut off fingers to mourn their dead family members. 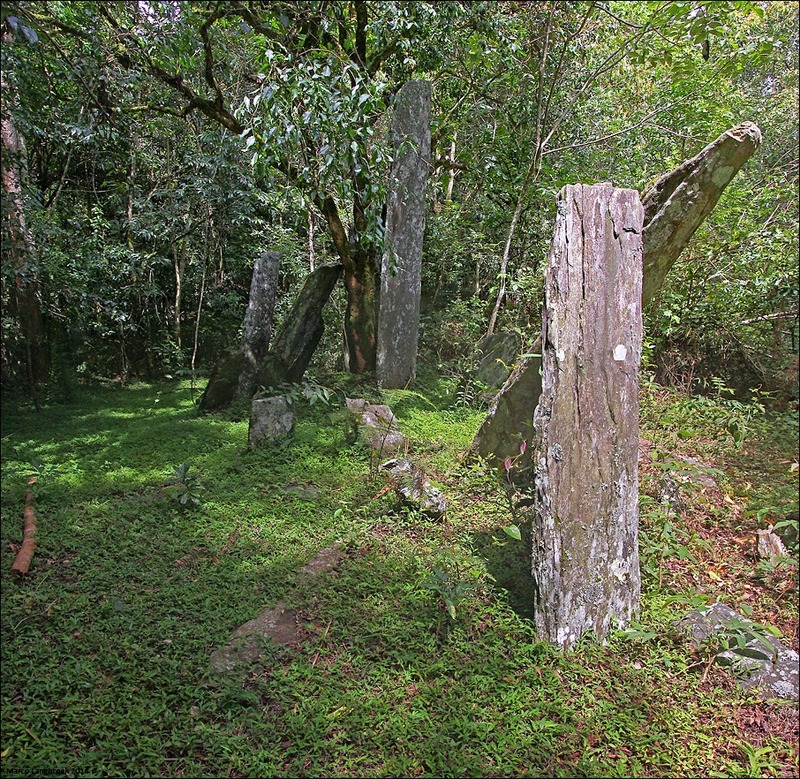 However, the prehistoric inhabitants of Maros are not modern Dani. Missing fingers in the Maros hand stencils can have completely different meanings, from fingers folded to code messages or symbols, to fingers missing because of injuries. We simply do not know. Hand stencils together with dots interestingly enough appear to constitute the oldest form of cave art. Leaving a hand print is a very tactile, direct way of connecting your person to a place, while a dot is a simple but efficient way of leaving your permanent mark on a place too. Making this connection between you and your surrounding environment, marking your place in your surrounding world (and later depicting elements of this world, such as animals, that you need to make sense of), might have been one of the initial purposes of early cave art. In that same paper, I argue that this characteristic need of H. sapiens to create visual anchors to grasp their surrounding world, actually points to a developing neurological and cognitive 'weakness', compared to other hominins such as Neandertals, and that the roots of symbolic behaviour in H. sapiens appearing during the late Upper Pleistocene might be in this neurological weakness. Early cave art such as the art at Maros, might be a symptom of this. 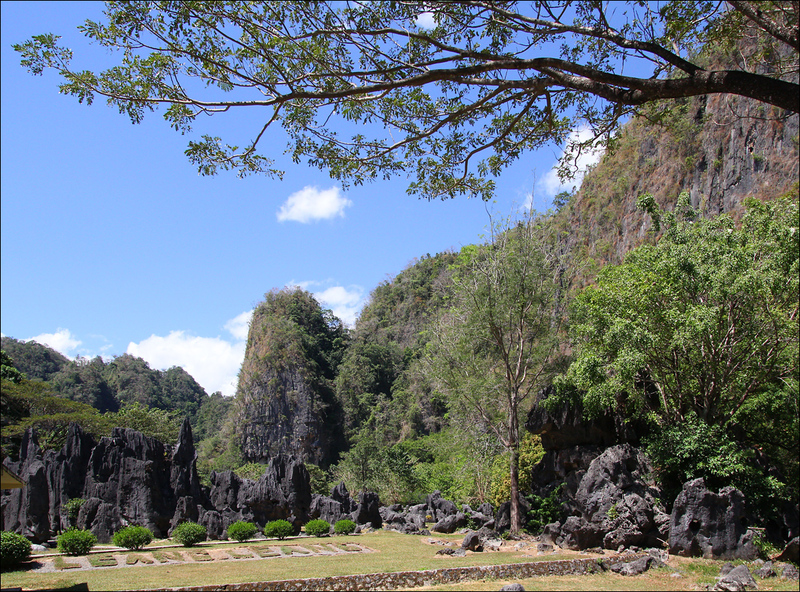 The caves can be reached as a day-trip from Makassar or the small town of Maros. 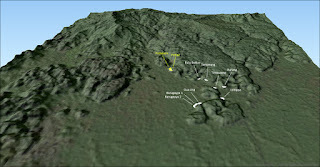 Makassar is some 33 km southwest of the caves, Maros is about 12 km to the northwest. Our trip started in Makassar. If you can afford it, it is probably best to rent a car with driver in Makassar (or drive it yourself, if you are brave enough to deal with Sulawesi's chaotic traffic and the left driving). Alternatively, you can travel there by Kijang (shared taxi) or taking a series of pète-pète's (very small vans, usually painted light blue, with benches mounted to the sides. They travel more or less fixed routes). 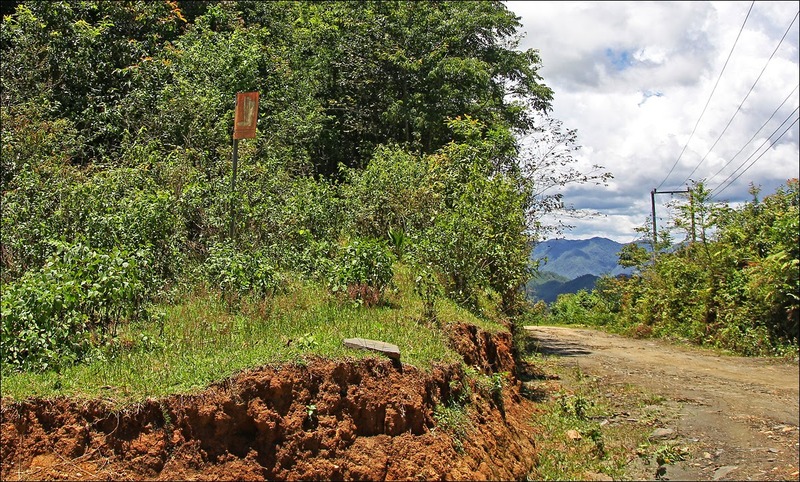 The park can be reached through a small side road leaving the main road Maros-Soppeng at about 5o.01392 S, 119o.6521 E. Follow the side road northwards for about 5.3 km. 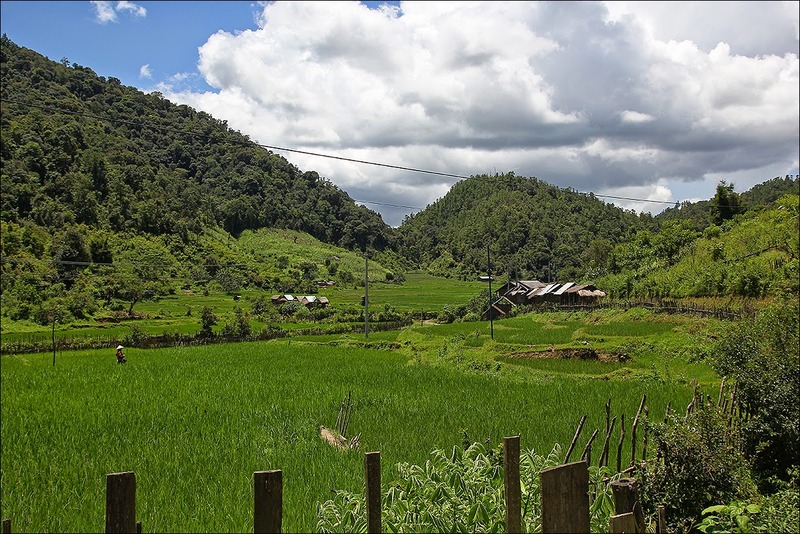 Along the road you will have scenic views of the rice paddies and rock walls, and in July-August (harvest time) plaids with drying rice and cloves line the side of the road. The entrance to the park is located at 4o.9782 S, 119o.67405 E. There is a parking lot directly behind the gate. 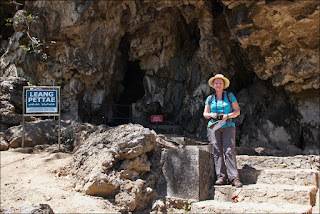 The caves are not on the normal Damri (bus) or pète-pète routes, so if you take a (series of) pète-pète's, as we did, you have to ask the driver if he is willing to take the 5.5 km detour off the Maros-Soppeng main road (best is to get out on the junction and there charter a pète-pète to the caves). 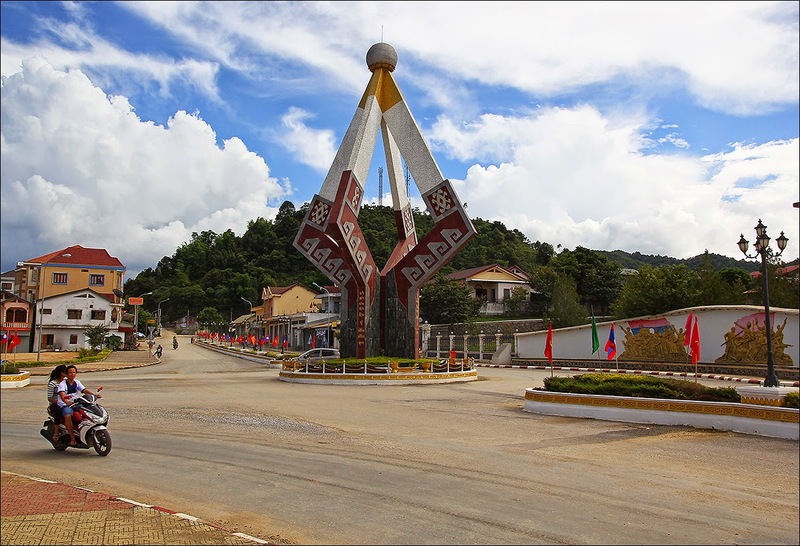 You'll probably also want to arrange a time with the driver for a pickup on the way back (I suggest about one hour after you have been dropped-off), unless you want to walk back the 5.5 km to the main road junction. From Makassar, take a taxi or pète-pète to Terminal Daya, the bus station on the eastern outskirts of Makassar. 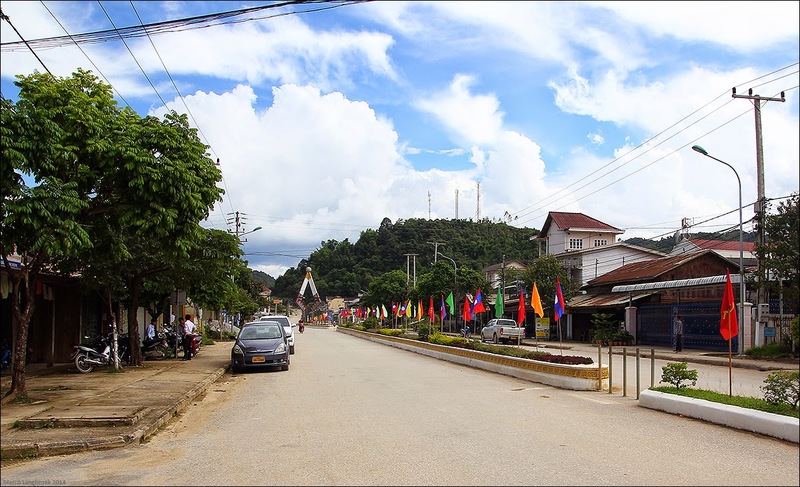 There you have to find another pète-pète that brings you in the direction of Maros (just flag them down at the main road and ask whether they go towards Maros). Somewhere along the route (the driver will indicate where) you have to get out and get into yet another pète-pète, and maybe even another one some time after that. It takes about 3 hours to get to the caves this way. A few kilometer east of Leang-Leang Park is a waterfall called Bantimurung, that is another popular destination. 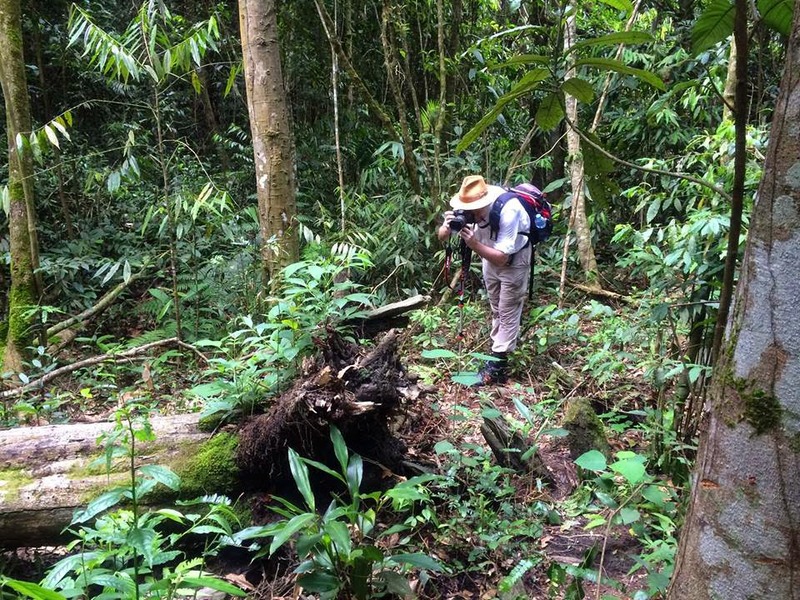 When you say you are going to Maros, people will initially assume that the waterfall is where you want to go. 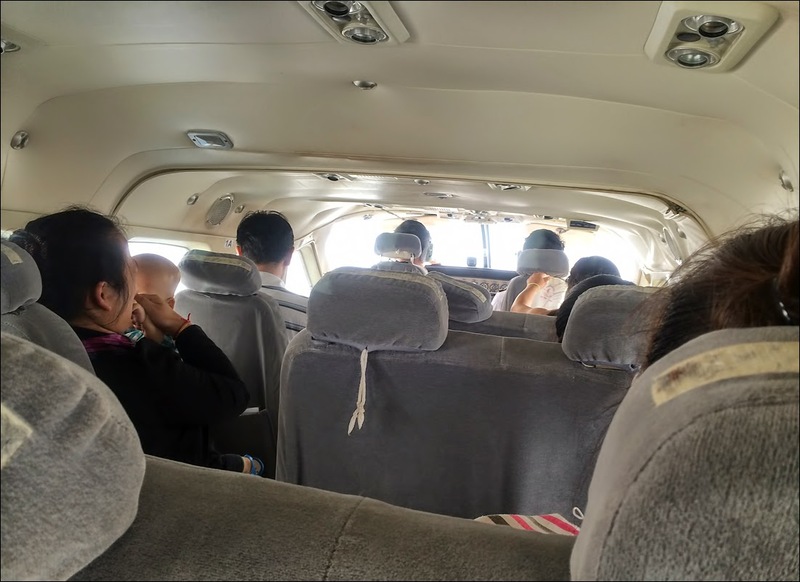 Travelling outside Makassar in a pète-pète is somewhat unusual for tourists, and will generate smiles and hilarious surprise with the Indonesians boarding the pète-pète. Even when they do not speak English, other people on board usually will try to strike up a simple conversation with you, asking you where you are from and your destination. 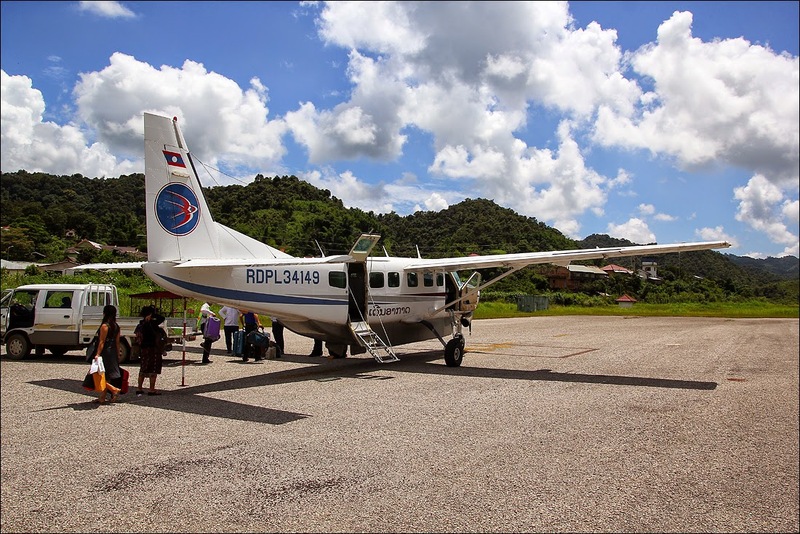 The people of Sulawesi are generally very friendly and helpful, something which we experienced in a wonderful way on this trip. In one of the pète-pètes, we got into a conversation with a young woman, called Wati, who spoke English and turned out to have family in the Netherlands. 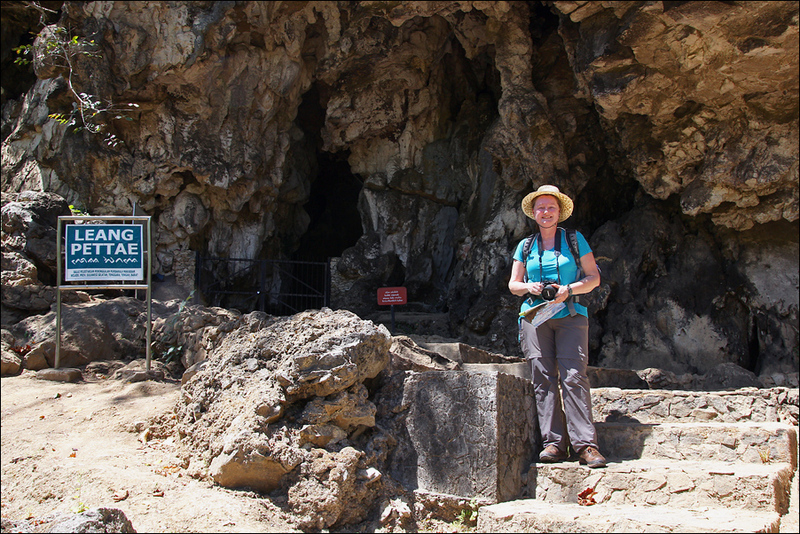 Wati was a bit worried that we wouldn't reach our intended destination: so she spontaneously decided to accompany us on our trip to the caves! As we had not arranged a pick-up when going back, we initially walked back part of the road towards the junction, until miraculously an off-duty pète-pète came by which we chartered to the junction. It was a rather hot, cloudless day. As we walked, young Indonesians on motorbikes passing by invariably greeted us with a cheerfully yelled "Hello Mister! ", the universal mantra greeting tourists everywhere you go in Sulawesi. Wati used the walk to distribute folders for her employer to the people living alongside the road. 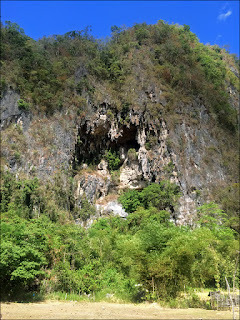 Karst cave along the road from Leang-Leang Park to the main route junction. A family living along the road spontaneously invited us to come in and sit with them in the shade on their veranda, offering us some refreshments and snacks. 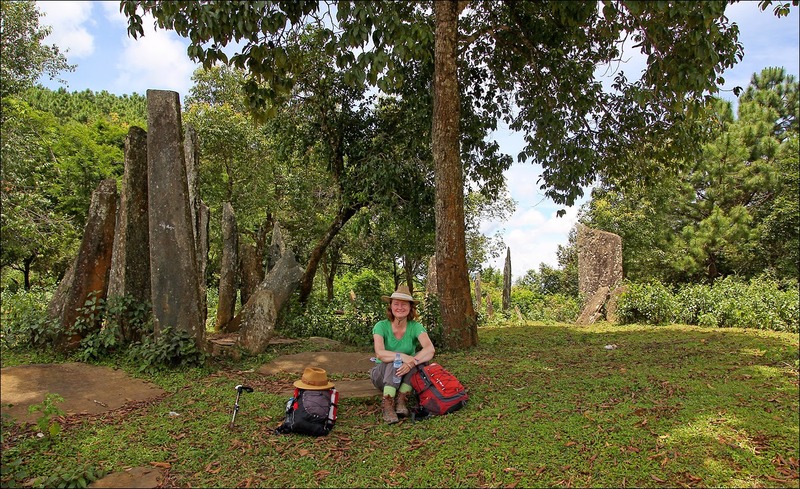 This is not uncommon while you are travelling in rural Sulawesi: the people usually are very hospitable to strangers. It can cause you some dilemma: you don't want to offend your friendly host, but is the lemonade they offer you safe to drink? "Live Dangerously! "as Sukarno said, but do use your common sense when making such decisions. 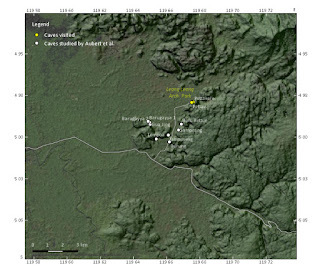 Aubert M. et al., 2014: Pleistocene cave art from Sulawesi, Indonesia. Nature 514, 223-227. 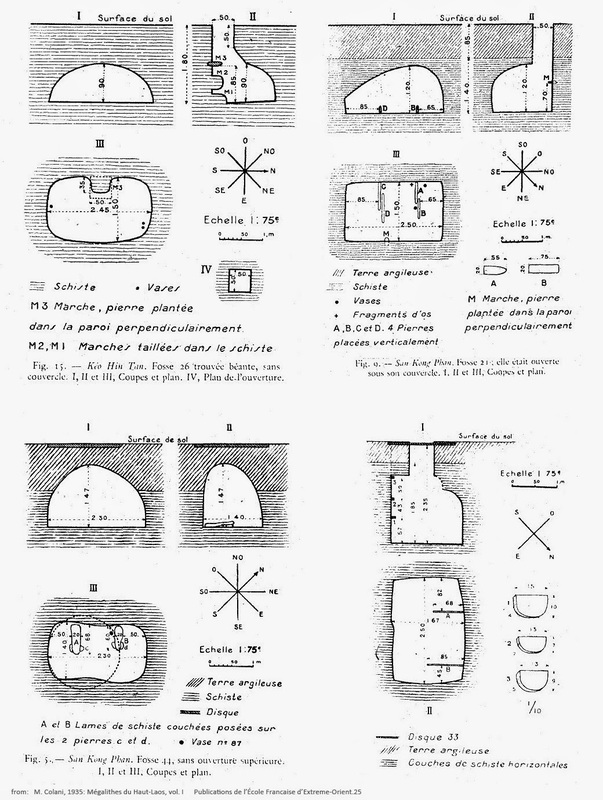 Combier J., Jouve G., 2014: Nouvelles recherches sur l’identité culturelle et stylistique de la grotte Chauvet et sur sa datation par la méthode du 14C. L'Anthropologie 118, 115-151. García-Diez M. et al., 2015: The chronology of hand stencils in European Palaeolithic rock art: implications of new U-series results from El Castillo Cave (Cantabria, Spain). 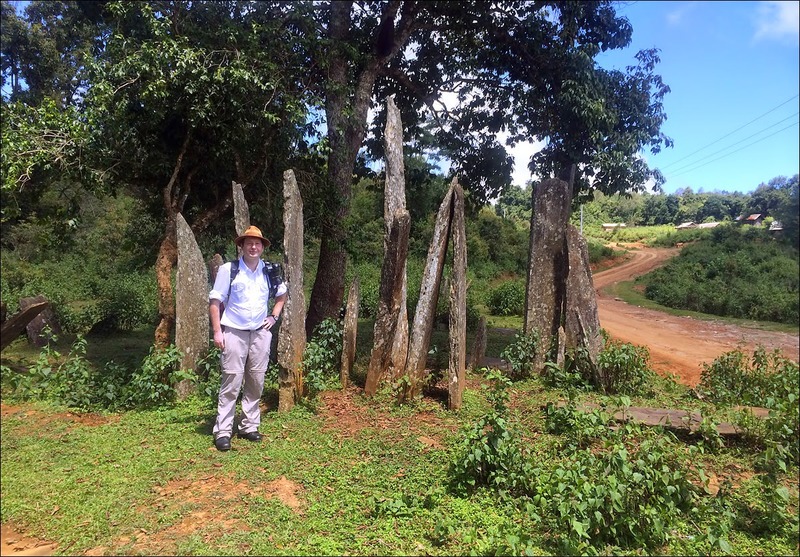 Journal of Anthropological Sciences 93, 135-152. Glover I.C., 1976: Ulu Leang Cave, Maros : A Preliminary Sequence of post-Pleistocene Cultural Development in South Sulawesi. Archipel 11, 113-154. Langbroek M., 2014: Ice age mentalists: debating neurological and behavioural perspectives on the Neandertal and modern mind. Journal of Anthropological Sciences 92, 285-298. Lewis-Williams J.D., Dowson T.A., 1988: The Signs of All Times. Entoptic Phenomena in Upper Palaeolithic Art. Current Anthropology 29, 201-245. Van Heekeren H.R., 1957: The Stone Age of Indonesia (1st edition). Brill, Leiden.